In preparation for painting a Zulu Wars British Force, I tested all 48 of the green acrylic paints I own for opacity, coverage and vividness. I intend to do this with other colors as time permits. Obviously this test is not comprehensive. I will probably add to it if I get more paints. The first number is “vividness” on a 1-3 scale, with 1 being a vivid green, a 2 being an average green and a 3 being a drab green. This is a somewhat subjective standard, of course.. Some paints may have a parenthetical letter that indicates if the color has a noticeable brown (r) hue or blue (l) hue. If a paint is not otherwise described, it’s a “normal” blue. Abbreviations: VMC means Vallejo Model Color. Due to issues with Vallejo changing paint names, I included the stock number. VGC means Vallejo Game Color. VGCX means Vallejo Game Color Extra Opaque. VMA means Vallejo Model Air. VSP means Vallejo Surface Primer. VPA means Vallejo Panzer Aces. CSM means Craft Smart Matte. I’ll use the full name in the paint list, but the abbreviations after that. Citadel Nurgling Green A/A/2/A – a greener version of VPA Russian Tank Crew II Highlight. Vallejo Panzer Aces Russian Tank Crew II Highlight A/A/3/A – a very light grey-green. Vallejo Panzer Aces Italian Tank Crew Highlight A/A/3/A – A very light, pastel green. Vallejo Panzer Aces USMC Tank Crew Highlight A/A/3/A – a light grey-green, lighter than VPA Russian Tank Crew I Highlight. Coat D’Arms Scorpion Green A/A/1/A – A very good bright green with excellent opacity and coverage. Citadel Moot Green A-/A/1/A – Less bright than Coat D’Arms Scorpion Green. Craft Smart Matte C/B/1/B A mediocre paint with poor opacity and coverage, especially for green. Close to Coat D’Arms Scorpion Green. Citadel Sybarite Green A/A/2/A – a bright medium green. Citadel Sotek Green A/A/1/A – A good darker blue/green. Vallejo Panzer Aces USMC Tank Crew A/A/3/A – a pastel, dark blue/green. Citadel Kabalite Green A-/A/1/A – Slightly lighter than RHD Bright Turquoise. Reaper HD Spruce Green C/C+/1/B – A very disappointing green. Poor opacity and coverage. I may re-test it later. Slightly lighter than Citadel Sotek Green, but inferior. Vallejo Model Color 891 Intermediate Green A/A/2/A – A good solid medium green. Darker than CDA Bogey Green. Coat D’ Arms Goblin Green A/A/2/A – Very close to Citadel Warboss Green, but slightly brighter. Citadel Skarsnik Green A/A/2/A – the lightest of the medium greens. Coat D’ Arms Bogey Green A/A/2/A – A nice, somewhat dark medium green. Citadel Warboss Green A/A/2/A – Very close but slightly duller than CDA Goblin Green. Vallejo Panzer Aces 346 Splinter Splotches A/A/2/A – A nice medium green, a bit bluer and darker than VMC 891 Intermediate Green. Reaper HD Meadow Green A/A/2/A – One of the darker medium greens. A little brighter than Reaper HD Turf Green. Vallejo Panzer Aces German Tank Crew A/A/2/A – A darker medium green, slightly less saturated than RHD Meadow Green. Vallejo Panzer Aces USMC Tank Crew A/A/2/A – A slightly lighter version of VPA German Tank Crew. 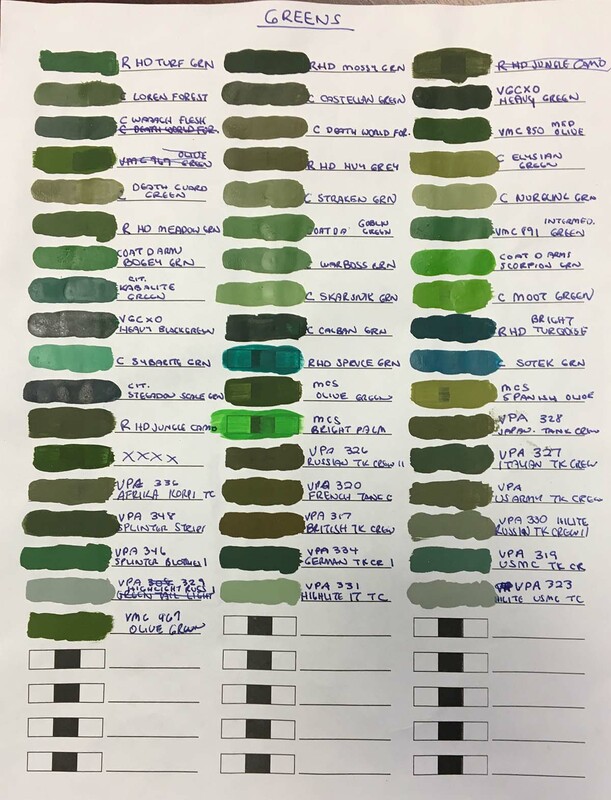 Reaper HD Turf Green A-/A/2/A – One of the darker medium greens. Vallejo Model Color 850 Medium Olive A/A/2/A – A good, solid medium olive. Vallejo Model Color 967 Olive Green A/A/2/A – A good, solid medium olive, brighter than VMC 850 Medium Olive. Reaper HD Mossy Green A/A/2/A – A dark olive green. Citadel Straken Green A/A/2/A – A lighter version of VMC 850 Medium Olive. Citadel Nurgling Green A/A/2/A – A lighter version of Citadel Straken Green. Vallejo Panzer Aces 348 Splinter Strips A/A/2/A – A dark medium green; close to, but a little brighter than Reaper HD Jungle Camo. Citadel Loren Forest A-/A/2/A – Lighter than RHD Mossy Green. Reaper HD Jungle Camo A-/A/2/A – A dark medium green. Craft Smart Matte Olive Green B/A-/2/B – A craft paint version of VMC 850 Medium Olive. Inferior in coverage and opacity. Craft Smart Matte Spanish Olive B/A/2/B – A craft paint version of Citadel Elysian Green. Inferior in coverage and opacity. Vallejo Panzer Aces Afrika Korps Tank Crew A/A/2/A – Almost identical to Citadel Death Guard Green. Citadel Elysian Green A/A/2/A – Darker olive; slightly lighter than Citadel Death Guard Green. Citadel Death Guard Green A/A/2/A – Darker olive; slightly darker than Citadel Elysian Green. Citadel Death World Forest A/A/2/A – Close to Reaper HD Heavy Grey. Reaper HD Heavy Grey A/A/2/A – Close to Citadel Death World Forest. Vallejo Panzer Aces Russian Tank Crew II A/A/2/A – More brown than most other colors. Vallejo Panzer Aces French Tank Crew A/A/2/A – More brown than most other colors; slightly lighter than VPA Russian Tank Crew II. Vallejo Panzer Aces Japanese Tank Crew A/A/2/A – More brown than most other colors; very close to VPA French Tank Crew. Vallejo Panzer Aces British Tank Crew A/A/2/A – More brown than most other colors; almost a brown. Citadel Castellan Green A-/A/2/A – slightly darker than Citadel Death World Forest. Vallejo Panzer Aces US Army Tank Crew A-/A/2/A – Slightly lighter than VPA French Tank Crew. 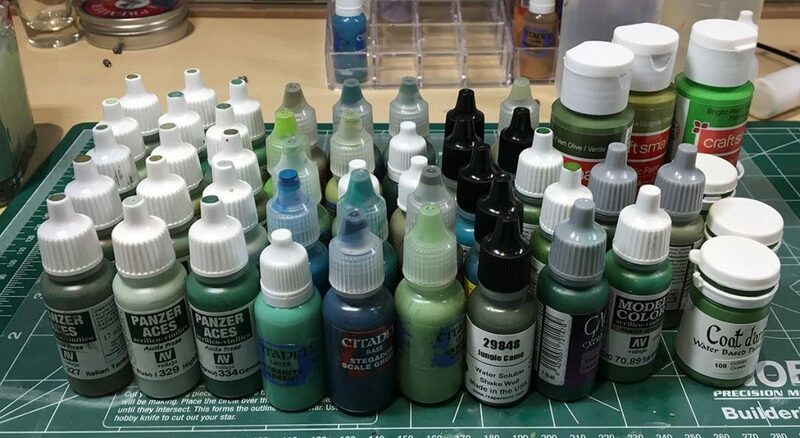 Vallejo Game Color Extra Opaque Heavy Blackgreen A/A/3/A – Very close to and better than, Citadel Caliban Green. Citadel Stegadon Scale A/A/3/A – a very dark blue-green. Citadel Caliban Green A-/A/3/A – Very close to VGCX Heavy Blackgreen. Reaper HD Bright Turquoise A-/A/1/A – a darker turquoise. I obviously have too many greens; being a military modeler, this is a hazard. Almost all of the greens had excellent opacity and coverage. The “best” in each category is my personal opinion of what looks best.